i try this product one year ago when the first time i see this product in some ad, they called "jun ji hyun serum". like, really? this product not to expensive and jun ji hyun love this product? so i decide to try, combine with phytoniacin from thiz brand too. the result so good, make my face glowing. this is good to try with other skincare. I bought this when have a sale. And i'm really not regret buying this. Thia worked on my skin. I apply this after apply someby mi miracle toner. This product has light texture and it brightening my skin tone and fade my acne scar. It also reduce my little acne on my skim and also a little bump on my forehead. 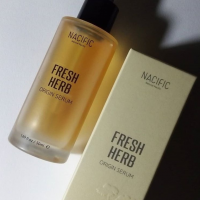 I like it, i like the smell so orange-ish.. i have one bottle but use for almost two year and still did not finish.. give me a fresh feeling after use. Improve my skin, makes my skin lightens a bit. Cleanse my pore. And if i think my skin is damaged with skincare product, when i use this serum it will makes my face feels funny for awhile. I believe that it is because the serum is detoxing my skin from harmful particle. I love it very much. In my experience, it didn't sting on the first and second use. But on the third use, I decided to use it straight after toning and I finally felt a little stinging sensation, especially on my forehead and cheeks which are currently my problematic areas. But the stinging is just very light, almost unnoticeable. But this really does sting when there's an active pimple. This is actually the new formula where aloe water is used instead of purified water. I also love the new packaging, frosted glass and all. This is a bi-phase formula so make sure to shake it gently to mix the oil and essence inside before using. 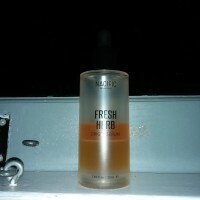 This serum smells like lemonade with honey which I really liked. This has a sticky finish which can be a little heavy. I didn't notice any difference during the first few days but eventually my skin looked more radiant and some parts of my face were smoother. During the days that I've skipped using it, my face would look dry and dull. I would consider this almost an HG but I currently have a love-hate relationship with this one. Vit C accelerates cell turnover so it helped my pimples come to a head. This also caused some purging on my cheeks and forehead a day after. However, I suffer from easily clogged pores and the acceleration is sometimes too fast for me to manage, that tiny whiteheads immediately become cystic acne the following day.